The Heretics marks a thundering return for Rotting Christ with its sprawling, poetic storytelling and a limitless supply of venom. 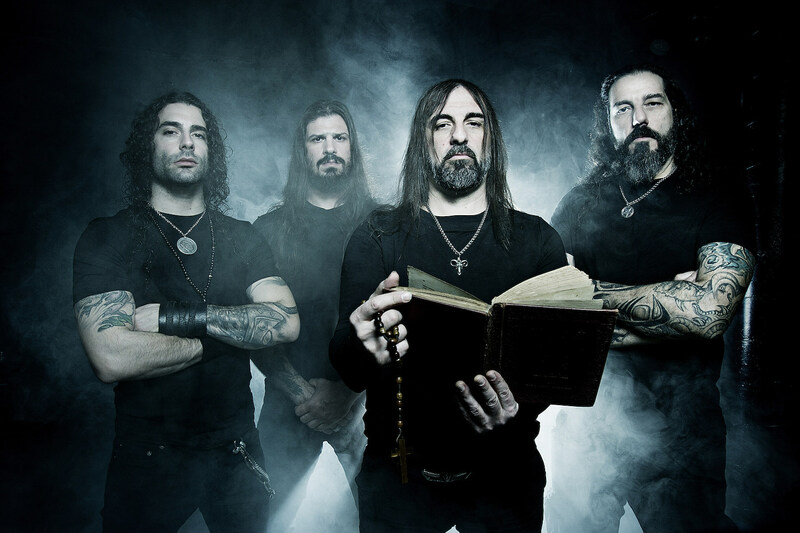 Rotting Christ have been active since 1987 and over the years and many, many releases, they haven’t wavered in their mission. The Heretics is another entry in their storied battle against established religion and complacency, using razor-sharp lyrics, thunderous riffs and pounding drums. Sourcing inspiration from John Milton, Edgar Allan Poe, Voltaire, and more, this record is a well-rounded diatribe set to some of the most epic metal this young year has offered thus far. Perhaps it’s being surrounded by ancient history in Athens that inspires Rotting Christ to revel in a deep, chanting atmosphere, but the scope of what appears on this record eclipses what we heard on their last outing Rituals, by several orders of magnitude. “In The Name Of God” is the opening track and its biting message is complemented by some of the biggest riffs we’ve heard from this band. The vocal approach as always is varied, given that three band members are contributing, and the tone ranges from bitter to angry, often supported by choirs, disembodied screams and more. All of these elements culminate in a fantastic first track that is only let down by the spoken word moments that bookend the song. It’s hard for them not to come off as just a little less genuine, especially when contrasted with the rest of the song and production. This is an issue that pops up here and there throughout the album. It’s by no means a deal breaker, but it overall lessens the impact of the song. “Vetyr Zyle” is one of my favorite tracks on The Heretics, as it embraces the black metal elements that often recede a little too far in their sound at times. There’s also a nice lilting rhythm and groove that plays over the soaring vocals by guest Irina Zybina, which contrasts well with the band’s deeper vocals. It’s a brief affair at just over three minutes, and I found myself going back to this track more than once. “Heaven And Hell And Fire” moves back into the heavier realm, with archaic choral mantras and earth-shaking riffs. We also finally get some tasteful solos near the midpoint, which is a nice change of pace and pushes the song from good to great by their inclusion. Amidst all of these rather epic compositions, it becomes evident that Rotting Christ have perfected their unique approach to both subject matter and its delivery. The commitment to maintaining their identity, but improving upon it, should be applauded even when the final product is a polished, albeit melodramatic, affair. Whether the slightly overwrought nature of their music and message are cheesy or commendable is in the eye of the beholder, or the ear of the listener. It’s my opinion that one must buy in, either ideologically or artistically, to their approach for this band, and by extension, this album, to work. To be fair, just a little faith will do as it’s impossible to deny the extent to which The Heretics excels at accomplishing the vision of its creators. As the album marches on, the tracks continue with pounding drums, fiery vocals, and pummeling riffs. “Fire God And Fear” offers up more black metal leanings with a considerable groove and another fantastic guitar solo. “The Raven” sends The Heretics out with a song that is dense with literary and musical approaches, painting a vibrant, beautiful finishing touch. Rotting Christ have made one of their most impressive productions to date, with dynamic songs, powerful instrumentation and venomous words for those they see as oppressors. This isn’t a lean album of blackened death metal; it’s a tragic, potent, and powerful display worthy of your time. Previous PostStream Kaleikr's Fascinating Début LP "Heart Of Lead" in Full Right Now!